Dark blue suit, shiny shoes: The man was polished. But on a recent afternoon at a 7-11, he did something about as polished as a country bumpkin. He slapped down his money and slammed the shot before even walking out the door. A 5-Hour Energy shot, that is. Beverages used to sell based on the cheap or tasty factor. People didn’t seem to need “function” from their daily drinks. Or maybe they just didn’t know they did. Red Bull changed that thinking more than a decade ago, and if at first it was taboo to admit that you actually liked these highly charged hybrid beverages — Red Bull’s initial strategy was to market it as a vodka mixer in bars, after all — today even the classy set has no shame in making energy drinks a part of their daily pick-me-up. That lifestyle is still going strong. It’s refreshment with a kick, says Strahm, a means for always being “on your game,” courtesy of your high-tech drink. In fact, energy drinks aren’t even close to hitting their stride according to Strahm, who now runs his own drink distribution company in New York. Red Bull, Monster, and Michigan-based 5-Hour Energy may control about 80 percent of the market, but there are about 200 others jockeying for the rest at any given time. Recent bad press, such as reports stating that the high amounts of caffeine in Monster have allegedly caused cardiac arrest and death, don’t seem to be much of a determent, either. In a culture of constant stimulation, why is it that we need all this extra energy? Brian Turner works out. He’s health conscious. He’s also the developer of that new drink, “Feel.” It’s light and refreshing. It has 15 calories and about as much caffeine as a cup of coffee. That’s one of Turner’s points: Is the energy craze really anything new? But if our culture over the years has always gravitated to more subtle sources of energy like plain old java, the beverage industry is now gravitating to healthier versions of energy drinks in order to entice people who don’t like coffee, or women who would rather not ingest tons of sugar and calories from a can adorned with glowing green claw marks. Health is one of the strongest driving forces in the business today, says Turner, who always wanted Feel to be the boost both women and men were looking for without all the baggage of coffee and other sugar-packed energy options. 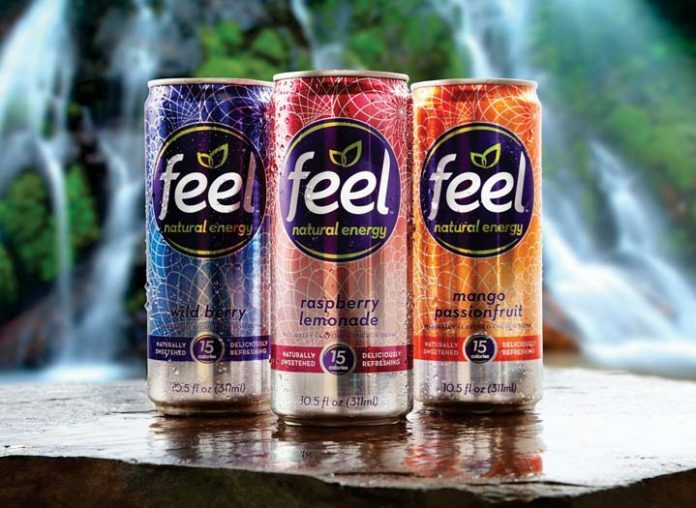 “We developed the drink to go where the market is going — health-aware, active individuals who legitimately need an energy boost,” Turner says of Feel, which does not contain artificial flavors or sweeteners and is sold at Whole Foods, Plum Market, and other area retailers.